For contact information please see our. 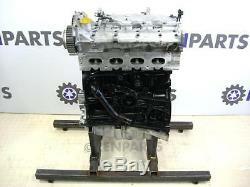 Renault Sport Clio 197 / 200 06-12 Reconditioned Engine F4R 830. Engine is tested and in full working order. Rebuild process includes: Complete strip down of engine and clean / degrease, new piston rings, new bottom end bearings, Crank re-grind if required, valve seats re-cut and checked, valve stem seals replaced, all clearances checked, camshaft polished and angles checked, head skimmed + Pressure tested. Leak-down test completed on every unit. All our staff are fully trained, and have a huge knowledge and experience working on Renault vehicles. Supplied as bare engine only, does not include ancillary items such as Manifolds, Alternator, Injectors, Starter motor. These can all be swapped from your original unit. If any of these parts are required they can be included for an extra cost. (Picture used for illustration purposes only). We will keep your old engine upon fitting of this engine. Suits all Renault models Listed Below. Renparts is your premier source for quality guaranteed Renault spares. We are always dismantling a huge range of Renault Cars and Light Commercial vehicles both old and new. All parts are stored in our 10000 sq ft indoor premises, our electronic stock system allows our sales team to give a full history of the part, including age, mileage and condition immediately. Everything we sell is backed up by friendly customer service, and a wide knowledge of the Renault range, making sure you, get the correct part first time and on time. Cash (On parts collected from our premises). All items are packaged by our staff with care using recycled packaging materials. If goods are faulty we reserve the right to Repair or replace them. Our Business Address: Renparts Ltd Sandtoft Industrial Estate Belton Doncaster DN9 1PN United Kingdom. The item "Renault Sport Clio 197 / 200 06-12 Reconditioned Engine F4R 830" is in sale since Tuesday, September 19, 2017. This item is in the category "Vehicle Parts & Accessories\Car Parts\Engines & Engine Parts\Complete Engines". The seller is "renparts_ltd" and is located in Doncaster. This item can be shipped worldwide.